There are two types of respiration namely the internal and external respiration. As mentioned by Rastogi (1982) the internal respiration or also known as cellular respiration involved the supply of oxygen to the tissues and the production of carbon dioxide and metabolites due to metabolism activities while external respiration is basically the mechanism effects of taking the air into the lungs. Anabolism and catabolism are under the metabolism processes. The metabolism processes in the animals body depends on the nutrient and oxygen supplies. The comparison of lungs structures (we are using two different species of frogs) and the fish gills to observed the differences and understand the adaptations and advantages as well as disadvantages of these two structures. The respirometer is set up as shown in the following diagram (figure 1). It consists of a wide-mouth bottle with an airtight-cork. Through the cork, a fine 1 ml graduated pipette is inserted. No leaks are ensured in the assembly (silicon rubber or grease is used to plug any leaks). The bottle is used as an animal chamber. A small platform made of wire mesh is made. Cotton is briefly soaked in 15% potassium hydroxide (KOH) solution and has put under the wire mesh so that it did not come into direct contact with the frogs. KOH is used to absorb the carbon dioxide produced by the frogs during respiration. In this way, the marker moved in one way, inward. The frogs of relatively small size are put inside a plastic bag and weighed to the nearest mg and introduced into the chamber. The cork fitted with pipette is put and syringed and tightly fitted to the mouth of the bottle. The frogs are kept at rest for at least one minute inside the chamber before experiment started. A drop of coloured indicator solution (marker) is added in the pipette and adjusted to start position (0.0 ml) using the syringe. The movement of the marker is recorded at 5 minutes interval for 30 minutes. As the frogs started to consume oxygen, the indicator moved inwards. Temperature or pressure alteration affected the displacement of the marker. The experiment is repeated with a dead specimen (or something with the same mass as the specimen in place of the organism) to control these factors. The displacement of the second experiment from the first is calculated. A Sultan fish is taken out from the bag and swiftly put into the ice to kill it. It was put on the aluminium paper for operation. Sultan fish is then operated by slicing it from mouth to stomach to take out the gills using small surgical blade. The gills are slowly pulled so that it was in a good condition. the gills are then wiped with tissue and observed carefully. The structure of gills is sketched and labelled. A graph of Weight Vs Total Oxygen Consumed is plotted based on the experimental results. 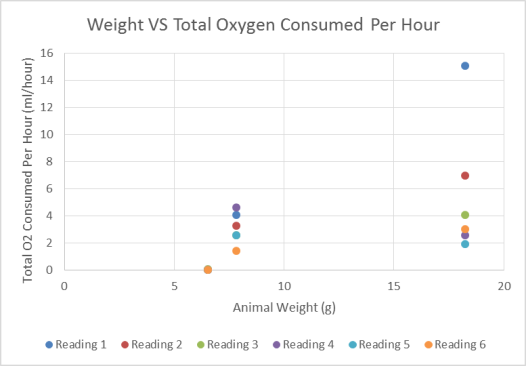 The x-axis represents the weight of the animals, while the y-axis represents the rate of oxygen consumption. The weight of the animals gives effect towards the rate of oxygen consumption. 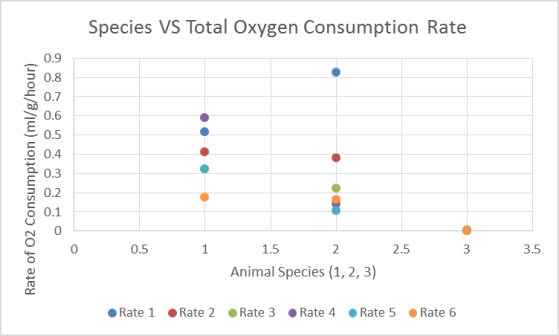 Another graph of Species Vs Total Oxygen Consumption Rate was plotted according to the experimental results. Different species shows different oxygen consumption rate. Different species have different surface area for oxygen absorption. Therefore the rate of oxygen consumption in each species differs. Rate of respiration depends upon blood carbon dioxide level expressed as CO2, which in turn controls the series of reflexes to adjust changed respiratory demands of the body. Respiration is accelerated when the oxygen and carbon dioxide contents fluctuates. Respiration process itself depends on site of gaseous exchange. Oxygen concentration is greater in lung alveoli(101 mmHg) than in blood of the lung capillaries(40 mmHg). Oxygen will diffuses naturally into the blood capillaries. Carbon dioxide diffuses from blood into the alveoli thus diffusion of both oxygen and carbon dioxide gases, there is diffusion gradient that determines the direction of their transport. The oxygen consumption measurements were made on two animals of different body masses which are 7.8496g and 18.2584g. The bigger the body size of an animal, the higher the body mass, the higher the total oxygen consumption for the animal. However, specific oxygen consumption which is the rate of O2 consumption per unit body mass will decreased with the increased of body mass and size. As the body size and mass increases, the metabolic rate also increases. The rate of oxygen consumption is measured as the rate of oxidative metabolism. Not all animals have similar rates of oxygen consumed. This is because they are influenced by numerous factors. For example, their environment, physiology, non-locomotory, activity metabolism, body mass and size. Small animals have less total oxygen consumption than the large ones. For animals that have similar physiology, their rates of oxygen consumption increases as their body mass increases. Toad is a poikilothermic. Their body temperature is near to the ambient temperature. The metabolic rate of amphibians and fish are sensitive to temperature and other variables which also shows a strong requirement on the oxygen supply. It is stated (Fox & Wingfield, 1937) that when two species within one genus are compared, the relation of oxygen consumption to temperature can be stated by a single curve. Species that live at higher temperatures consume more oxygen that arctic species of same genus that live in lower temperatures. Therefore, the rate of oxygen consumption of animals from warm and colder habitats is considered. The rate of oxygen consumption to determine the metabolism rate of the animals is measured considering the physiological states of the animals. The comparison of lungs structures and fish gills by observing the advantages and disadvantages of each structures of the organ.